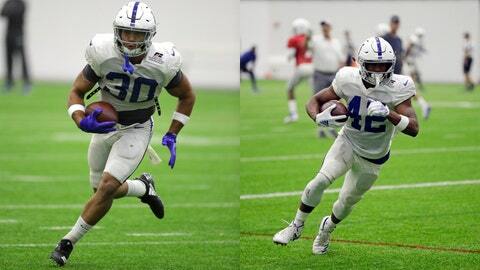 Colts rookie running backs Jordan Wilkins (30) and Nyheim Hines (42) will get plenty of reps for the time being with veterans Marlon Mack, Robert Turbin and Josh Ferguson sidelined. WESTFIELD, Ind. — Jordan Wilkins figured the days of working in an understaffed backfield ended at rookie minicamp. On Thursday, he rushed six times for 21 yards, caught one pass for seven yards and sealed the 19-17 victory by spinning away from a Seattle defender for a three-yard run on third-and-1. Reich called it a winning play Friday, shortly after announcing the injuries to Mack and Turbin. But unless general manager Chris Ballard makes a move or Ferguson gets healthy, these three backs will have to do the Colts’ heavy lifting.